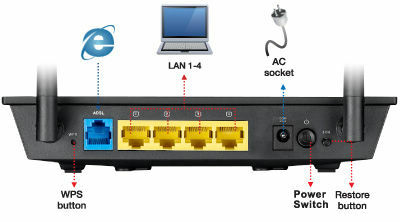 11n Wireless ADSL modem Router. 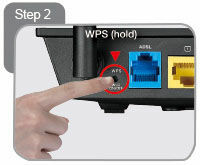 EZ WPS connection with physical WPS push button. Eco-friendly, up to 72% power saving. * The result given was of an internal testing methods comparing typical router, with standby, normal and heavy traffic. Testing criteria: [Standby mode] Only WAN port is connected. [Normal traffic] 1 wired connected PC and 1 wirelessly connected laptop for P2P download. [Heavy traffic] 4 wired connected PCs and 2 wirelessly connected laptops for P2P download. Utility cost is calculated based on 2011 US household avg. electricity price, all taxes included. 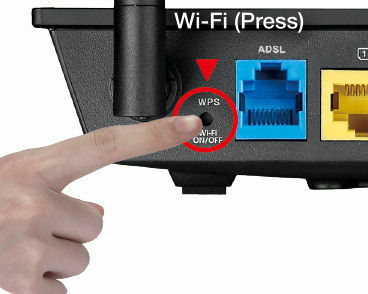 Press the WPS button on the wireless adapter.